In the summer of 1955, a floatplane flew a small group of American climbers to the edge of a massive icefield straddling the Continental Divide along the Yukon/Northwest Territories border in northern Canada. When the group saw the cluster of jagged peaks and sheer rock walls they were searching for, they were stunned: Emerging from the edges of the Brintnell/Bologna icefield was a 9,000-foot palisade of ice-polished granite that bore an uncanny resemblance to the craggy spires of Yosemite. Having underestimated the challenge he and his team would confront that day, expedition leader Arnold Wexler turned to his partners and declared most of the icy peaks to be “unclimbable.” Today, still largely untrodden because of its extreme remoteness, the “Cirque of the Unclimbables” remains legendary in the world of rock climbing. Now, however, the region is the focus of Canadian scientists for another reason: its vanishing ice. In August, I accompanied a group of Canadian researchers monitoring the retreat of the icefields surrounding the “Cirque of the Unclimbables.” The scenes that greeted us were nothing like those seen by Wexler or the scientists who took aerial photographs of the icefields in 1982. Instead of pristine, crystalized layers of firn that are typically left over from past winter seasons, we found an atrophying glacial surface darkened by sand and dirt. 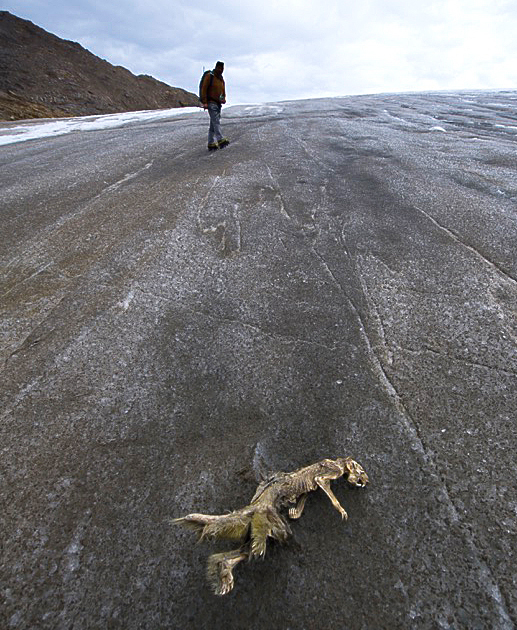 In several places, we came across the frozen carcasses and bones of caribou and wolverines that had fallen into crevasses decades or even centuries earlier and had melted out of the disappearing ice. Between 1982 and 2008, this glacier-covered area in the Selwyn Mountains contracted by about 30 percent, from 101 square miles to 71 square miles. Its retreat has accelerated since then. 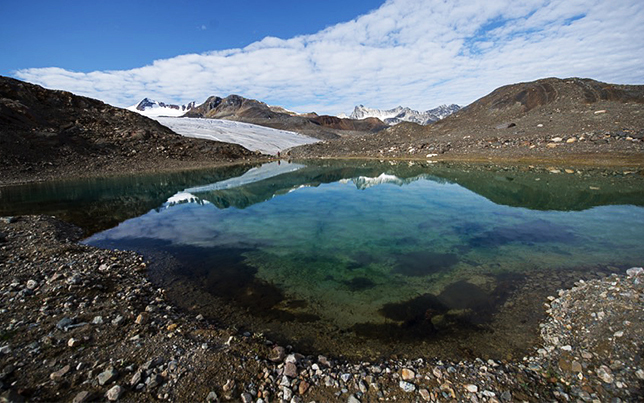 Understanding what is happening on and around the icefield has not been easy for scientists from the University of Victoria, the University of Saskatchewan, and the Geological Survey of Canada. For the better part of the week we were there, University of Victoria atmospheric scientist David Atkinson and graduate student Eric Courtin worked to reassemble a weather station that had collapsed earlier in the summer when the ice unexpectedly melted out the guy wire anchors holding it up. Weather hampered everyone’s work. Two days of cold, hard rain; a snowstorm; and a violent cold-weather thunderstorm forced the scientists to abort plans for an aerial survey, as well as an ongoing study of lichens to determine the age of rock that has been exposed by retreating glaciers. The re-drilling of a number of glacier poles — used to determine the depth of snow or ice that has melted — was also abandoned. In spite of the setbacks, Atkinson and his colleagues are optimistic that the data they are collecting will, in time, give them a clearer picture of what is happening in this part of the world. “This weather station that we have set up is designed to give us a day-to-day, hour-to-hour view of what impact the weather is having on the icefield,” said Atkinson. 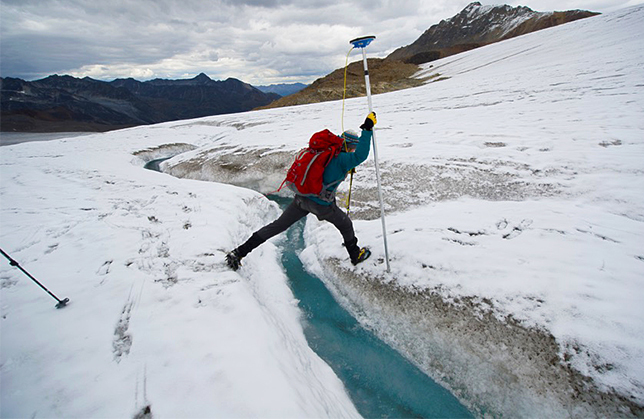 Together with hydrological studies and other monitoring, this meteorological research will enable the scientists to better track the rapid changes in the icefields. The fact that a cluster of glaciers in the Northwest Territories is melting is hardly earth-shattering news. A recent report by the World Glacier Monitoring Service indicates that hundreds of observed glaciers around the globe are currently losing between half a meter and one meter of ice thickness every year — two to three times more than the corresponding average of the 20th century. What makes the Brintnell/Bologna and nearby glaciers unique is that they comprise the last extensive icefield remaining in the interior of Canada’s Northwest Territories. And because temperatures are rising so rapidly here, the icefield appears to be melting at a rate three times the global average cited in the World Glacier Monitoring Service report. The Brintnell/Bologna icefield plays a very minor role in the hydrology of the Mackenzie River, which drains 20 percent of Canada’s landmass, gathering waters from British Columbia, Alberta, Saskatchewan, the Yukon, and Northwest Territories. But with the ice and snowpack in the Rocky Mountains melting, spring weather noticeably warmer, and snowpack in the Mackenzie Mountains diminishing, the demise of the Brintnell/Bologna icefields is a strong indicator of what the western Arctic of North America might face in the future. Climate change is already manifesting itself in a variety of ways in this largely unexploited wilderness. Northern Transportation Company Ltd., which delivers food to aboriginal communities and to oil and mining camps in the western Arctic, was forced to alter its barge schedule on the Mackenzie River this year after unprecedented low water levels prevented barges from reaching the Arctic coast last August. Scientists say that by mid-century, 15,000 of the 40,000 lakes in the Mackenzie Delta could dry up if the climate continues to warm as forecast. Regionally, the impact of the demise of the icefield and surrounding snowpack will be more pronounced. With less ice and snow melting out of the Selwyn Mountains, Virginia Falls — twice the height of Niagara — may no longer be as thunderous as it is now along the South Nahanni River. Caribou and other animals will no longer have an ice-cooled refuge to protect them from biting flies in summer. 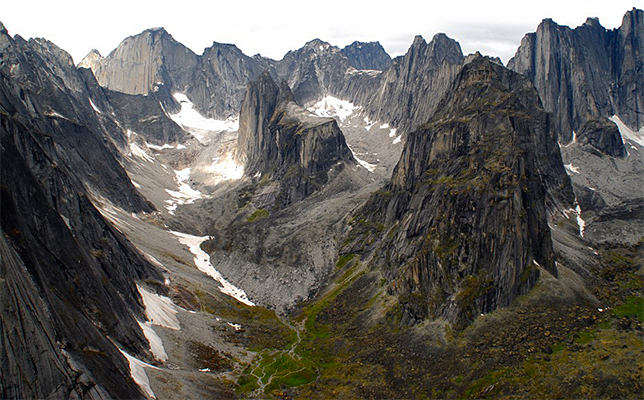 This is a concern to Parks Canada, which manages the surrounding Nahanni National Park and is partnering with the icefields study. Ed Struzik is a fellow at Queen’s University’s School of Policy Studies, Queen’s Institute for Energy and Environmental Policy. This essay was originally published by Yale Environment 360: http://www.e360.yale.edu It is republished by F&O with permission. The End of the Century is Now, in Northern Canada. Facts and Opinions is a boutique journal, of reporting and analysis in words and images, without borders. Independent, non-partisan and employee-owned, F&O is funded by you, our readers. We do not carry advertising or “branded content,” or solicit donations from foundations or causes. Please support us, with a subscription (click here), a donation, and/or by spreading the word.